I'm back! I've been traveling a great deal these past few weeks and I'm finally settled in back at home. It was a busy summer. There were five states to visit, fly fishing to observe, bison to avoid, family to feed, geysers to smell and plenty of driving--probably a little too much for the kids. I also had the pleasure of cooking for a gathering of family while at a rented lodge in Montana. I've realized that cooking for large groups is something best done out of one's own kitchen. As no matter how well stocked the brochure claims the kitchen is ("It has absolutely everything you will need for any meal you have planned! "), or how well you prepare, something you need will always be missing. Which results in things like… my trying to make individual lemon tarts topped with torched italian meringue without tart rings, a mixer or a candy thermometer. Attempting Italian meringue with microwaved syrup and some dodgy hand beaters actually worked. I didn't plan on making tarts there, it just sort of happened. Still, I think I deserve some sort of medal of recognition. Anyway, I'm back home and I am working on my plan of attack for this week's baking. For today though, we have some yummy ice cream. Which I will admit is my fall back during busy months as it can be prepared relatively quickly and always looks lovely. 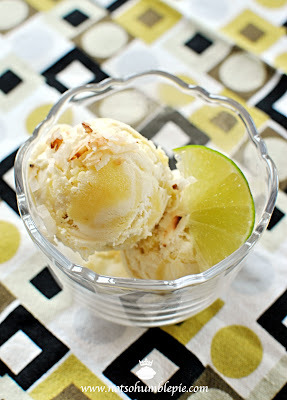 Today's ice cream is a combination of toasted coconut and lime. Yes, that's me holding onto the last scraps of summer with something decidedly tropical in flavor. Though regardless of the time of year, one has to admit it is hard to go wrong with such a combination. Harry Nilsson is nodding his head in agreement--his being alive or not is a technicality we're going to overlook. So let's get down to our ice cream making! *Use good stuff. Flavorless coconut makes for flavorless ice cream. Place a large skillet over medium heat and add your coconut. Toast the coconut in the dry skillet, stirring often. Remove from heat when the coconut is golden brown and fragrant. Divide the coconut, reserving 1/2 cup garnish later. Add the rest of the coconut to a medium sauce pan, along with the milk, cream, sugar, salt vanilla bean paste or vanilla seeds (scraped from the pod) and the bean too. Bring the mixture to a bare simmer and remove from heat. Cover and allow to steep at room temperature for an hour. This will infuse the cream with the flavor of toasted coconut and vanilla. Once the allotted time has passed. Rewarm the mixture and strain through a fine mesh strainer and remove vanilla bean (if using). With a spatula, firmly press on the coconut to extract every last drop of coconut infused cream. Discard the coconut. In a medium bowl whisk the egg yolks until fluid. Add the warm coconut infused cream, whisking constantly and then return the mixture back to the sauce pan. Place the sauce pan over medium heat and stir constantly (scraping the bottom) until slightly thickened (160°F and coats the back of a spoon). Strain the mixture once again and add the remaining 1 cup of heavy cream, coconut extract and rum (if using). Chill the mixture until very cold in your refrigerator (several hours or overnight) and then churn according to your ice cream makers instructions. When churned, transfer large spoonfuls of the ice cream to your storage container, layering it with small spoonfuls of lime curd. Use more or less depending how you want to balance the flavor of lime and coconut. The curd is very flavorful so too much will overpower the subtle toasty notes of the coconut ice cream. Transfer the ice cream to the freezer to chill until firm. Melt the butter over medium low heat in a medium sauce pan. Remove from heat and whisk in the sugar, lime juice, zest, salt and eggs. Return to the heat and cook, stirring frequently for 10-15 minutes, until the curd has thickened and coats the back of a spoon. Do not allow the curd to boil, if it begins to steam pull it off the heat and stir to cool it down. Place a fine sieve over a bowl and strain the curd. Cover the curd and place in the refrigerator to cool completely (at least 2 hours). Serve this toasted coconut with lime ice cream with sprinkling of toasted coconut. The curd swirls look really great in there, but I have one bone to pick with the ice cream recipe. I disagree about the rum. In the words of a great(ish) man I once knew, rum is never optional. Hmmm... looks like summer to me! So fresh, love it! Your ice cream sounds divine. And I agree, I'd much rather cook in my own kitchen! I'm drooling!! Looks so good. What type of ice cream maker are you using? Still in the midst of looking for a good one. There are two ice cream makers I like. The first is a Cuisinart, since it is fairly inexpensive and I can--and do--buy plenty of additional freezer bowls for it. All the ice creams on the blog, save for a couple, have been made in this model. The other ice cream maker I recommend is a kitchen aid attachment. It does a great job of beating air into your ice cream which results in wonderfully textured ice cream. I should note, that if you have a Costco nearby, they often feature the Cuisinart on the cheap (often with 1 extra freezer bowl) during the summer months. Oh, I just made coconut ice cream myself last week! My husband doesn't love the coconut, but I adore it. This looks gorgeous--I'll have to flag it to make the next time he goes on a business trip or something. It's the middle of winter and I still love this post! Perhaps I will have to invest in one of the ice creme makers come summer! Until then I love the design on your napkin/tablecloth - it would make a fabulous quilt!